The more I write about and experiment with food, the more I realize how lucky I am to have the kind of food background that I have. When I was little, all I knew was that I got to eat all sorts of fun stuff because of the folks my parents knew in the restaurant business and the meals we'd have with certain close friends. Now that I'm an adult I know I received a stellar food education that allowed me to hone my palette quite early in life so that I could go nuts once I grew up (still waiting for the growing up part, by the way... lol). Case in point: my fascination with Thai food. One of our dearest family friends is from Thailand and during the few years he actually lived with us, he quickly immersed us in the rich culture and food of this amazing country. Whether it was a rich and fragrant soup he'd make from scratch, or a new experience at the best hole-in-the-wall Thai restaurant he could find, we were always having some new exotic dish. Yum Pla Meuk (spicy calamari salad) and Som Tum (green papaya salad) were instant favorites, and once I could handle the whopping fire that heats up many Thai curries, I couldn't get enough of those either. Despite trying what some would consider "strange" dishes while learning all about Thai food, I was always most intrigued by Thai dessert selections. 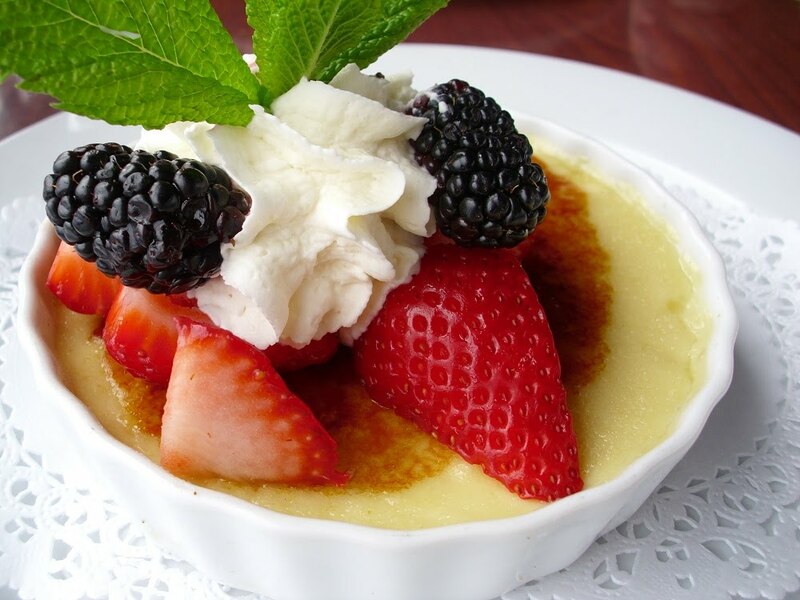 Mysterious, gelatinous looking fruits mixed with tapioca pearls or crushed ice; custards made from things I, as a child, had not yet heard of, like mung beans; even poached eggs served with sweet, aromatic syrups would make an appearance at our table after a satisfying meal. My two personal favorites were the Thai coconut ice cream (so much better than conventional coconut ice cream; I highly recommend it) and the sticky rice with mango. Though I'd love to try my hand at the former, Poor Girl has yet to score an ice cream maker, so that one will have to wait awhile. But what I have been able to do is recreate this very simple, yet exotic dessert and shove it into tiny little shot glasses to make my latest dessert shot recipe. Now, I'm not claiming that this is super authentic Thai cooking here; I know for a fact that it's not. But from Makeshift Moqueca to Cheater Chutney, I am always coming up with ways to cater to my more exotic tastes within my limited means. Traditional Thai sweet (or sticky) rice can be found at most Asian food markets, but I find that it's usually sold in such large bulk portions that it's not practical for me to buy it. Still, this recipe requires a certain type of rice; it's not like you can use your standard long grain varietal for it to work well. After doing a little bit of research, I found that many types of rice are similar to Thai sticky rice in terms of grain shape and consistency, so if you don't have access to the real stuff you can certainly do what I did and substitute another glutinous rice in its place. The two I would suggest are sushi rice or Arborio rice (the kind that's used in many risottos), because they both share the smaller, rounder grain shape as Thai sticky rice, as well as that important "sticky" quality. Once the whole rice thing's been taken care of, all you need is coconut milk and some fresh mango and you're good to go! This dessert takes very little time to prepare and looks fabulous when served up in tiny shot glasses (I'm sure they'd be awesome at a dinner party). Plus you won't get as full! Trust me, it's its own meal when served in traditional portions. This version will be far easier on your tummy and your wallet. Heat the coconut milk in a medium saucepan over medium-low heat, stirring constantly to avoid curdling. Bring to a low simmer, then add the sugar and salt and whisk together until combined. Remove from heat. Pour about 3/4 of the sweetened coconut milk onto the warm rice. Allow to sit for about 10 minutes or until the rice has completely absorbed the coconut milk. In the meantime, carefully peel and chop the mango into 1/2" pieces. Assemble your dessert shots by putting about 1 tablespoon of sweetened sticky rice into each shot glass. 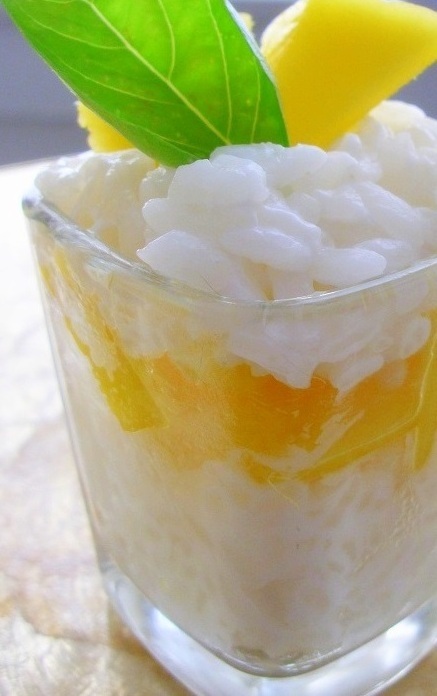 Layer a generous amount of mango chunks on top, then add more sticky rice. Top each shot with a small amount of the remaining coconut milk. Garnish with a couple extra pieces of mango and a basil or mint leaf, and enjoy! *If you can afford some or have some on hand, try mung beans or sesame seeds for a more traditional garnish. The more I work as a temp, the more I realize that it has a few advantages. You're sort of a free agent, you get paid weekly, and since you're not officially on the employee roster, you don't have to do things like break room duty and clean up after your coworkers. But temping has huge disadvantages, too: you get paid weekly (yes, it's nice, but it's also much harder to budget and pay big bills like rent this way! ), you have zero hope of health insurance, and things like national holidays or joining your mom on a 1 day stay-cation hurt your paycheck immensely. No holiday pay can make an enjoyable day like the 4th of July seem a little less exciting, because you know that celebrating the nation's independence is hindering your own independence. Financial independence, that is. Yeah, yeah, so what does all of this have to do with food, Poor Girl? It means I really can't afford to do much shopping outside my own kitchen right now. Which isn't out of the ordinary for me, of course. It's how I'm able to save on food and forces me to get creative. That's exactly what Bare Bones staples are for and I am ever-so-grateful for them, as they never fail to bail me out of a lot of tight spots. And not just financial tight spots, either! Cooking up a big batch of quinoa or brown rice or couscous at the beginning of the week can be a total time saver if you're uber-busy the way I've been this summer. For the latter part of the week, I decided to make use of the last bits of leftover veggies in my fridge and tossed them together with my remaining couscous to make a simple little salad. A couple of cans of tuna thrown into the mix for some protein, and I had an easy, tasty, and healthy salad that's just perfect for summer work lunches. There's nothing to this recipe, really. If you don't like the veggies I use in my version, feel free to make use of those you like the best. As for the dressing? I made a quick olive oil & lemon juice dressing for mine, but you can use your favorite bottled dressing or any other vinaigrette concoction to add some extra zip to your salad. Have fun with it! That's the beauty of dealing with bare bones ingredients: there's no choice but to put on your thinking cap and come up with something that'll make good use of leftovers and the few staples you may have in your pantry. And no matter how modest the end result turns out, you'll be surprised at how tasty the simplest ingredients can be when thrown together in just the right way. Chop the red bell pepper, cucumber, tomato and red onion into 1/4" - 1/2" pieces and grate the carrot. 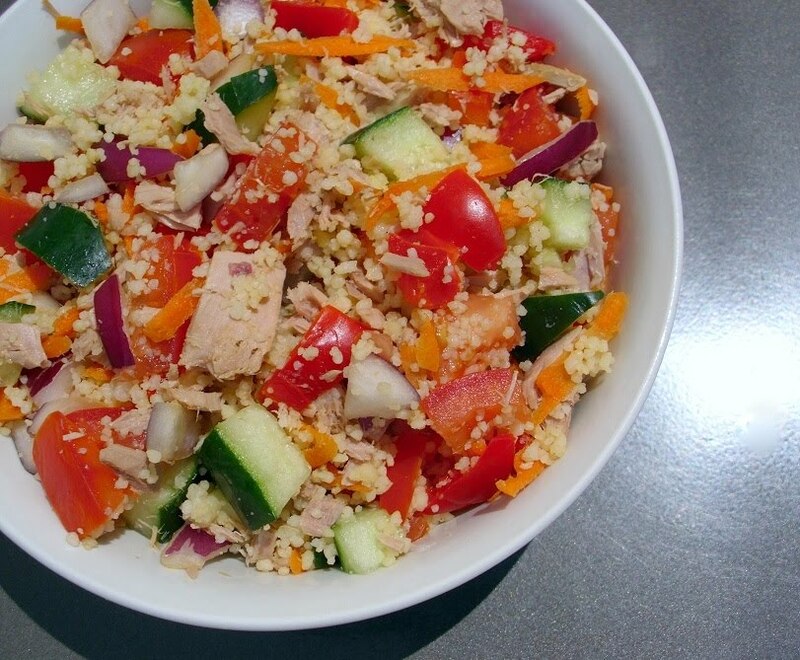 In a large bowl combine the cooked couscous, tuna and all the veggies and toss together. Add the dressing and mix to combine. Serve on its own or with some baby spinach or spring mix, and enjoy! The next day we focused on Cannery Row, and again decided to make use of the coupons we had for freebies. By this time I'd learned that The Fish Hopper, another highly recommended restaurant by locals, was part of the same family of restaurants owned by the Shake family, so I figured we'd be in for some more great food. Naturally, we had to stop and sample some of their clam chowder before we went inside, and it was hands-down the best chowder of the weekend! We definitely knew we'd be having some for lunch and couldn't wait to see what else The Fish Hopper had to offer. We started off with steaming bowls of the clam chowder and some White Zinfandel because my mom wanted to toast to a fabulous mini-vacation. 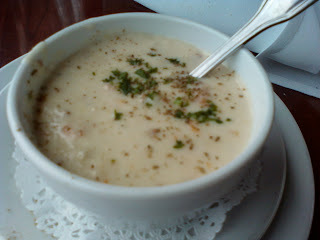 The chowder was thick, creamy, and packed with fresh clams, a welcome change from most clam chowders that feature the canned variety. It was also nice to partake of a clam chowder that wasn't filled with potatoes, which is one of my biggest pet peeves about most restaurant chowders. The warm, fresh sourdough bread we were served was the perfect accompaniment to our soup and I would have been perfectly content leaving lunch at that. But we had another coupon for a free appetizer, so we handed it over to our excellent server, Nicole. 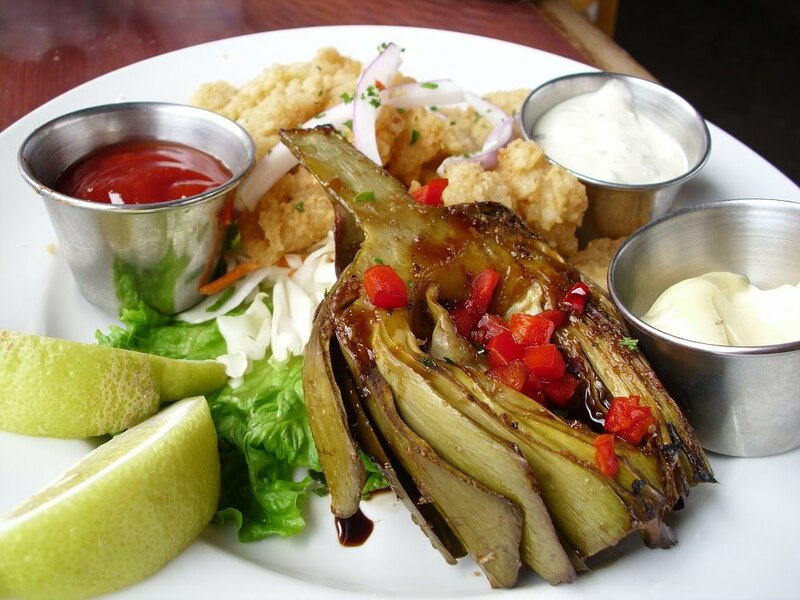 We ended up with the same Grilled Artichoke and Fried Calamari appetizer we'd had at the Grotto the night before, possibly because that was the chef's choice that week, but neither of us were bothered by that. I felt that the grilled artichoke from Old Fisherman's Grotto was much tastier than The Fish Hopper's, as it seemed to have been marinated a bit longer and grilled just a bit better. Mom graciously let me have about 3 pieces of calamari (she argued that since I was eating the artichoke, her "half" of the appetizer was all the calamari; and people wonder where I get it from, lol), and I found it to be far better than the Grotto's calamari. It was hot & crispy, right out of the fryer, so there was no chance for the breading to get soggy at all. If I could have combined the Grotto's artichoke with it, I would have had the perfect appetizer. 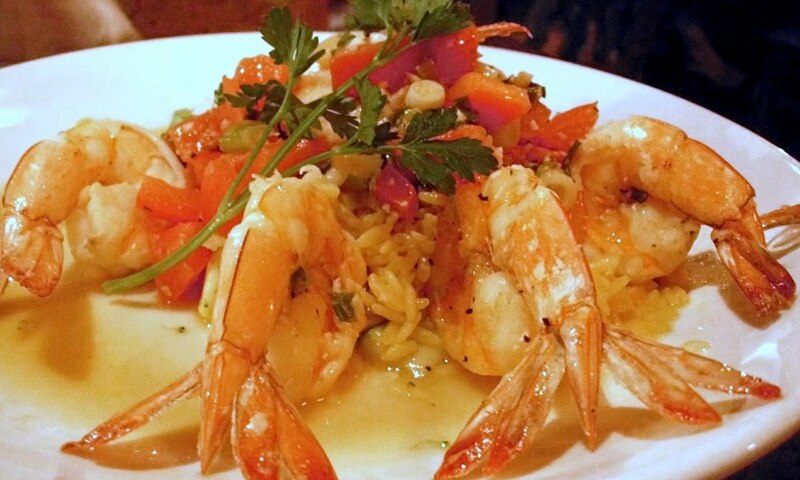 For our main course we decided to split one of The Fish Hopper's entrée salads. It took us forever and a day to come to that decision because their pasta dishes looked absolutely phenomenal. Still, we needed to stick to a certain budget and having the wine added to our bill, so we decided it'd be best to split something instead of ordering two entrées. The California Seafood Salad seemed the most appealing to both of us, and I'm happy to report that we made the right choice. 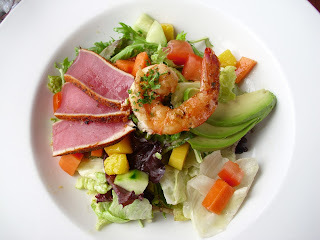 Perfectly seared ahi tuna and giant grilled prawns were served atop a bed of crisp spring greens with fresh papaya and mango, a lovely honey-mustard dressing rounding out the dish beautifully. Though I would have happily devoured the entire portion myself, it was still quite satisfying when split into two portions, especially after having a bowl of that hearty clam chowder. Since we had a server who actually cared about her guests, we were offered dessert via their dessert tray, filled with mock-ups of each dessert that's served at the restaurant. I know it was made of wax, but I was instantly drawn to the Vanilla Creme Brulee, while Mom was all about the chocolate mousse. We'd considered splitting a dessert but because we were both adamant about our choices, we ordered one of each, on the condition that neither of us would be allowed to try the other's dessert (this is why people think we're sisters - we are ALWAYS bickering!). 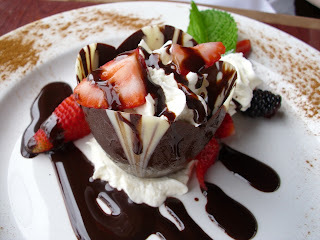 Mom's chocolate mousse was served in a delicate dark & white chocolate "cup" and topped with hundreds of fresh berries and thick, homemade whipped cream. 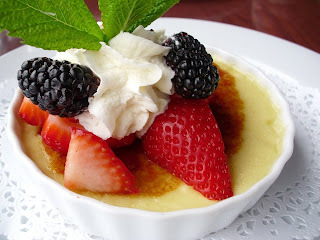 My vanilla creme brulee was so beautiful it hurt, the golden brown top shell caramelized to perfection, reminding me of that brief scene in the movie, Amelie, where she describes cracking that top shell as one of her simple pleasures. Topped with some of the same gorgeous berries my mom was served with her mousse, this was a wonderful dessert that was so generous in portion I couldn't finish it all. Service-wise, our experience at this restaurant was the complete opposite of what we'd dealt with at Old Fisherman's Grotto. Our server, Nicole, was probably one of the best servers I have ever had the pleasure of meeting. She practically oozed personality and made everyone in her section feel like they were her only guests. Though the food was equally good in each restaurant, having a server like Nicole would have made all the difference in the world had we had her serve us at Old Fisherman's Grotto the night before. Alas, that was not the case, but I made sure to let The Fish Hopper's GM know about our excellent service and wonderful food. After years on the front lines of the restaurant business, I know that compliments are few and far between compared to the complaints, so anytime I can let management know how well their restaurant is doing, I do so immediately. Overall, both restaurants were wonderful, each with its own distinguishing features. The fact that they both offer seafood that is sustainably and humanely raised was just the icing on the cake for me, since I'm always trying to find food that is good for me and for the rest of the planet within my very limited means. Sure, visiting these types of establishments can't be done everyday, but it's good to know that there are places you can visit on your vacation that feature great food, good specials, and spread good karma by choosing the right foods to serve. A couple weeks ago, my friend Catherine & I went berry picking in Apple Hill. Situated in the foothills about an hour northeast of Sacramento, the Apple Hill area is famous for (surprise, surprise) its apples and all the delicious baked goods that are sold at every farm and stand. During the summertime, Apple Hill is fairly quiet compared to the hustle and bustle of the fall months when crowds go wild with all the apple picking. However, there is still plenty of lovely regional produce to take advantage of during these hot summer months, particularly fresh, sweet berries. It was the first time I'd gone berry picking in an official capacity, and except for the fact that it was already about 90 degrees by 11 a.m., it was a lot of fun. The surroundings were lovely, I took zillions of photos, and I left with a fair amount of blueberries, blackberries and black raspberries without going completely bankrupt. The beauty of picking your own berries at these farms is that you can get the ripest sweetest berries for a fraction of what you would pay at a grocery store (plus a few for free, should they "accidentally" find their way into one's mouth rather than one's bucket). I'm sure you've all seen those small plastic clamshell containers of blueberries at the grocery store, barely full and priced at around $4-5/container. Sure, you get your berries but they're quite expensive this way, and you don't always get the juiciest, sweetest berries. We were lucky enough to score our blueberries for just $3.50/lb, making it possible for me to leave with about 3 lbs. of deep blue anti-oxidant heaven. Our blackberries and raspberries were slightly more expensive at $4.50/lb and $5.50/lb, respectively, but they were also well worth it. Catherine passed on the black raspberries because she found them too small and seedy for her liking, but I couldn't possibly leave without at least one clamshell container full of bite-sized, solid Chambord! Their distinct flavor is simply irresistible, and they can be pretty difficult to find and/or afford in stores. Anyway, back to the blueberries. Until this berry picking adventure, I'd never been their biggest fan. The ones I'd tried in the past were either tasteless or perfume-y, definitely not like the sweet perfection of my favorite berry, the strawberry. But the ones I picked straight off the bushes were ripe, sweet, fragrant without being overpowering - they were just perfect! I immediately made some Superfood Nirvana Salad (sans kiwi, sadly) and my mind began buzzing with other recipe ideas. Since I'd been dying to try my hand at a clafoutis but was out of cherries, I thought I'd give it a go with some of my blueberry stash. Clafoutis (or "clafouti" for the gringos, lol) is another one of those impossibly rich, delicious French dishes that seems more expensive and difficult to make than it actually is. A custard that's thicker and more solid in texture, clafoutis is most commonly made with black cherries, but it can be made with just about any fruit imaginable. Berries lend themselves to this type of dessert quite well since there's no chopping involved, but I've seen variations using anything from peaches to plums to pears, so feel free to get creative with yours. I did just that and adapted this recipe by Dave Lieberman to include some of the sweetly fragrant lemons I'd scored from one of my coworker's trees. Lemon & blueberries have always gone well together in other recipes, so I figured they'd be wonderful together in a clafoutis. The result was a rich, creamy dessert accented by the sweet-tartness of the blueberries and the fragrant aroma of the lemon zest & juice. This is perfect for entertaining guests, as it looks and tastes fabulous but doesn't break the bank! Let's check it out. Preheat the oven to 350° and place the blueberries in the bottom of a small glass pan (8" x 10" for rectangular pans, 9" for round pans). In a medium bowl add the eggs and whisk lightly. Next, add the sugar and mix until the mixture becomes pale yellow. Add the milk and whisk together, followed by the lemon juice and lemon zest. Finally, add the flour and pinch of salt and whisk until completely combined. Pour the mixture over the berries. Place in the center of the oven rack and bake about 45 minutes, or until the center has puffed up and bounces back when lightly pressed. Allow the clafoutis to cool for about 5-7 minutes, then slice into 6-8 pieces. Dust lightly with powdered sugar, garnish with extra blueberries & lemon zest, and enjoy! Though I'm not the biggest bread eater (I love bread I just can't eat all that much without feeling tremendously full for the next 17 days), I couldn't help but jump at the chance to participate in the latest Tastemaker Program opportunity from the fine folks at Foodbuzz: hamburger & hot dog buns from Nature's Pride. Last year we Tastemakers had the opportunity to try their Buttermilk and Whole Wheat breads and I instantly fell in love. Always fresh tasting, perfect crumb, and completely natural without any of those evil additives like HFC; what's not to love, right? Since then, if I'm lucky enough to find a good sale on Nature's Pride I will definitely pick up a loaf. And I figured that if their sandwich bread is so good, their hamburger & hot dog buns must be pretty darned tasty, too. It wasn't until I got my big box o' buns that I remembered I'm not the biggest burger and/or hot dog eater either. Again, they're not things I necessarily dislike (though some hot dogs do scare me a little... I'll take a good hot Andouille or brat on a bun over a hot dog anyday), they're just not items I tend to cook for myself on a regular basis. Knowing I'll be a bit shorter on cash this month due to the holiday, I wasn't about to run to the store to get beef or turkey to grind & turn into some patties. So I did what a good Poor Girl always does and gleaned inspiration from my cupboards. As always, I had plenty of beans to choose from and decided to try my hand at making my own veggie burgers so I could pair them with the whole wheat hamburger buns from Nature's Pride. I instantly became an addict to my haphazardly thrown together bean-based burgers, and have tried a few variations with different beans since I started with this most recent food obsession. They're all delicious but my favorite is definitely the garbanzo version, perhaps because it kind of reminds me of giant falafel. To avoid some of the dryness that can come along with veggie burgers, I added some chopped crimini mushrooms, which made the burger patties a bit heartier & meatier. 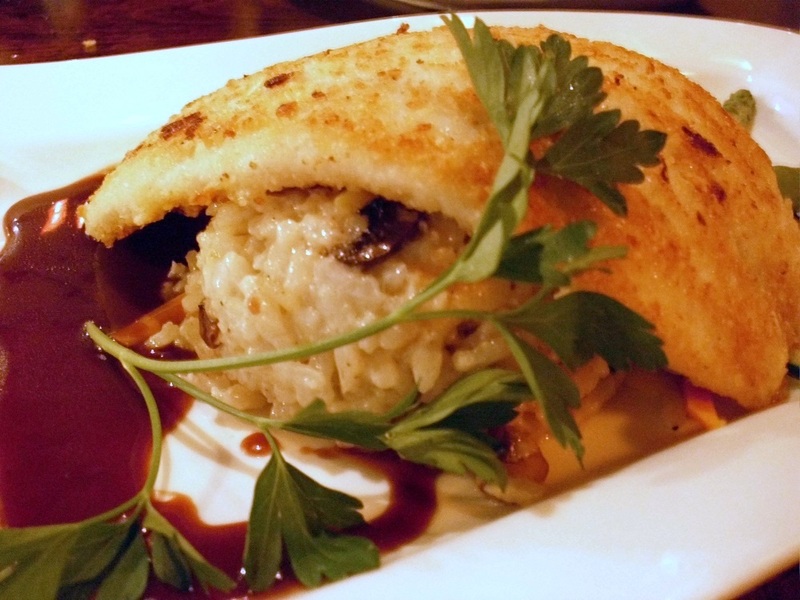 The addition of some sautéed mushrooms & onions on top rounds out the flavors and textures beautifully. And as with all burgers, the sky's the limit when it comes to the types of toppings & condiments you use! From a quick aioli made from the last bit of cilantro-pistachio pesto I had left to some good ol' Goddess dressing, tomato slices to avocado slices & baby lettuce, I've dressed these a million different ways. They're pretty good by themselves, but paired with the Nature's Pride whole wheat hamburger buns, these burgers are a tasty, healthy alternative to standard summer cookout fare that anyone can enjoy! Tomato slices, avocado slices, onions, butter lettuce leaves, mayo, tzatziki, etc. Finely chop half the onion and cut the other half into thin slices and set each aside in separate bowls. Do the same with the package of mushrooms. Using a food processor (or a large bowl and hand blender if you're like me and don't have the room for food processor), purée the garbanzos, egg, lemon juice and all the spices until the mixture is thick and slightly smooth (a few whole beans here & there is fine for texture). Add the chopped onions, chopped mushrooms and chopped cilantro and mix together. Next, add the panko crumbs and stir until completely combined. Carefully form small amounts of mixture into 1/2" - 1" thick patties and set aside. This should yield from 4-6 patties depending on size. In a small skillet, heat 1 tablespoon of olive oil and add the sliced onions. Cook over medium heat until they become translucent and begin to caramelize, about 3 minutes. Add the mushrooms, a pinch of salt & pepper and sauté for another 2 minutes, or until the mushrooms are nice & tender. Remove from heat. In a large skillet, heat the remaining 2 tablespoons of olive oil. When oil is hot, carefully place the garbanzo patties in the skillet and cook for 2-3 minutes on each side, until the outside is golden brown & crisp. Drain on a plate with paper towels. When ready to serve, assemble your burger with your favorite sliced veggies, top with the sautéed mushrooms and your favorite condiments, and enjoy! Okay, can someone please tell me where 2010 went? I think I was buried under 8 tons worth of blankets, parkas, and other cold-fighting materials during the first half of the year because I am certainly surprised to see July here already. So far, though, I am rather liking July: there are interesting things lined up but nothing close to the jam-packed schedule I was dealing with over the past few weeks. I enjoyed a very relaxing holiday weekend filled with gardening, fireworks, a trip to the lake, Grilled Steak Tacos and some Blackberries & Cream Popsicles. With the free weekend, I was also able to get a bunch of posts & photos edited and ready to share here on PGEW. Overall, not a bad start to this hot summer month! My one little mango dessert shot ended up being pushed to the back burner as a result of my cherry obsession, but I just had some last night and it was exactly as I'd hoped it would be! Can't wait to share it with all of you this week! I've been lucky enough to receive some great new items from the Foodbuzz Tastemaker program, including some awesome new hot dog & hamburger buns from the fine folks at Nature's Pride. And now I'm inspired to make some burgers or other interesting sandwiches with these, so stay tuned to see what I come up with! Gazpacho was another thing I wanted to get going in June and didn't get a chance to do. Life will NOT get in the way of gazpacho this time (especially since decent tomatoes are starting to pop up all over the place!). I know it's a little odd considering the heat, but I've been wearing my baking thinking cap lately and feel like baking. Cookies? Pie? Baklava? We shall see what comes out of Poor Girl's oven in a couple of weeks! The second 99-cent Store version of The $25 Shopping Cart is a-comin', but I think I'll probably his up Raley's/Bel Air this month, too. Their ads have been intriguing me as of late, so let's see if they can truly impress me with some good deals. Though I don't often go, I'm thinking of hitting up the California State Fair this year for a little social experiment. Rumor has it food will be very different this year, as one of the biggest purveyors of deep fried everything is unable to attend. It'll be interesting to see if other vendors step it up and offer some better alternatives to deep fried Oreos or Krispy Kreme chicken sandwiches. Let's see what happens! That's all for now, folks. 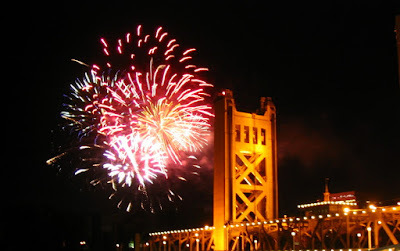 Hope you all had a fabulous 4th of July holiday and that you continue enjoying your summer! 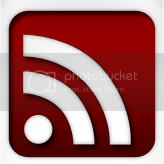 New recipe & random foodie party posts coming this week, too! I'm looking forward to this weekend so much it's not even funny. Not just because it's the 4th of July - a holiday I love more than most because it's my Daddy's birthday - but because I will have my first free-ish weekend for the first time in about 5 weeks. My schedule has been so jam-packed with one thing or another that I haven't had very much time to myself, and those of you who know me well know how much Poor Girl LOVES her "me time". Don't get me wrong: I hate being bored, too. It'll just be really nice to finally have a long weekend during which I have no concrete plans and can play things by ear. If I feel like going somewhere, I shall go. If I want to curl up with a good book or work on my tiny garden, I'll do that. And if I want to nap, darnit, I'm going to nap! But the other thing I'll be able to do is to finally catch up on all my half-posts and unedited pictures from dishes I've made and haven't been able to post because I've been so busy (including a special post on last weekend's crazy canning party, which should be fun). I actually had another recipe in mind when I said I'd be posting something new soon, but I made this yesterday for lunch and thought it would be a nice change of pace. 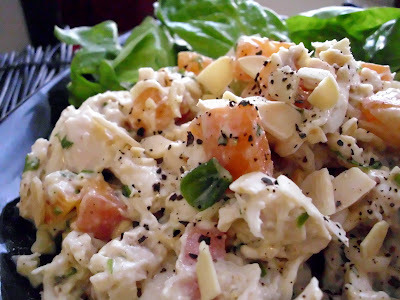 It's been awhile since I've done a good chicken salad, and this one made lovely use of some of the stone fruits that are taking over all the good farmer's markets in town. I actually scored 5 lbs. of plums, nectarines, white peaches and apricots for $5 during my last run (!!!!!!! ), an absolutely unheard of deal if I were to have bought the same at a grocery store. I made good use of the plums, peaches and nectarines as snacks for work, but had yet to dive into my apricot stash. Since I was already craving a chicken salad, all I had to do was change things up a bit so I could add this sweet little fruit into the mix. As usual, this is a great way to make use of any leftover chicken you may have hanging around in the fridge. By keeping the dressing light with nonfat yogurt, this will be creamy, slightly tangy & sweet instead of being rich & heavy. The crunch of the almonds and zip of the scallions add fun texture and flavor. If you don't have access to fresh apricots right now, or if they're too expensive in your area, dried apricots would also work well in this easy-to-make salad. And as with most chicken salads, this is very versatile! Use it in sandwiches, as a fun pita filling, on a bed of crisp greens, or just straight out of the bowl. Let's check out this no-brainer recipe! Combine the yogurt, Dijon mustard, honey, lemon juice and salt in a bowl and whisk together until completely combined. In a larger bowl, add the chicken, apricots, chopped onion and almonds and toss together. Add the dressing a couple spoonfuls at a time and mix together (if you like your salad a bit on the dry side, a few tablespoons should suffice; for a creamier salad, use the entire amount of dressing). Garnish with plenty of freshly ground black pepper, serve on a bed of greens or use as a filling for a nice pita sandwich, and enjoy! Though it's actually quite easy to use the SNAP benefits on one's card, my first experience using my EBT card was a little rocky. No one really tells you what's covered and what's not, but I figured that obvious things like cleaning supplies, alcohol, etc., wouldn't be included. I was a bit bummed that pet food didn't count as I am a very proud cat mom and will argue that they deserve a decent meal just as much as I do, but I suppose that makes sense. What made no sense to me at all was my failed attempt to purchase one of those pre-cooked rotisserie chickens. Now, I would have normally bought a regular chicken and cook it myself, but on that day there was a sale on the rotisserie style chickens. Always conscious of prices when I shop for food (or anything, really), I knew that this was a much better deal and that I could make plenty of different meals out of my one chicken. But when I went to pay, I nearly swallowed my tongue at how much my out of pocket bill was. I was counting on spending $4 for the kids' cat food, but was told I actually owed $10! What??? I asked the cashier why the amount was so high and I was told that - get this - the chicken counts as "prepared" food and is not covered by SNAP. So let me get this straight: one can buy as much candy, Twinkies, Pringles, Hot Pockets, and any other ridiculous, processed, sugar/salt & fat ladened junk food imaginable but a chicken is off limits? A chicken from which I could have made plenty of salads or soups or pasta dishes that would have been more nutritionally balanced than any of the junk food that is covered by SNAP? How is that even remotely okay, especially when a growing number of people are suffering from Type II Diabetes and other issues that stem from poor diet choices? We all know that there's an obesity epidemic in the United States. Fortunately some pretty prominent people like First Lady Michelle Obama and Chef Jamie Oliver are trying to draw attention to this problem and help give Americans the tools to change with their Let's Move and Food Revolution programs, respectively. But it's difficult for some people who receive assistance through SNAP or other programs to make the right choices when the wrong stuff is available to them in abundance. Many people receiving SNAP have children, and we all know that kids tend to gravitate towards things like candy, chips, cookies, or anything with fun, colorful packaging that feature their favorite cartoon characters. The food industry makes it easy for anyone to fall into their trap with their clever marketing (yours truly included... I'm a sucker for those Lindt truffle commercials), and when you're hungry and trying to make ends meet for your family, you're going to choose what your family's actually going to eat. But the health ramifications of these poor diet choices are starting to take their toll on Americans, particularly on American youth. Statistics for things like obesity and diabetes are staggering, with new reports showing that this country is just getting fatter and unhealthier. Granted, this isn't purely diet related, as our country has becoming quite inactive and sedentary (Lord knows I'm having a rough time with the sedentary desk job & perpetual blogging workout plan; hooray for good workout videos & better weather for outdoor exercise so I can get back to normal!). But our nation's obsession with fast food, convenience food and junk food is a huge contributor to many of these health issues. And the correlation between obesity and poverty is now becoming quite apparent. A New York Times article focusing on the obesity-hunger paradox reports that in low-income areas of New York City, particularly the Bronx, individuals who are the hungriest are swiftly becoming the most obese. The lack of stores & restaurants with healthier food alternatives gives those on a very limited income few choices when it comes to feeding their hunger. Many of these folks have or will develop a myriad of conditions ranging from high cholesterol to high blood pressure to heart disease. When these conditions worsen, the result is missed time from work and expensive doctor visits and hospitalizations, creating even bigger financial hassles for those who are already struggling. It's a vicious, vicious cycle that seems to be spinning out of control. Now I'm of the opinion that the system could help do its part to reduce this growing problem by eliminating coverage of junk food and other unhealthy foods. Naturally, this becomes a bit of a problem when it comes to fast food joints that will honor SNAP and offer - well, you know - fast food. Some areas of the nation have fewer grocery stores than fast food restaurants, leaving those on restricted incomes little choice for food (though education could help these folks make better choices while at these restaurants, but that's a whole other blog). But for people who are able to access grocery stores who will honor SNAP, it would probably be a lot easier to focus on healthier food options if the "bad stuff" was not an option. I mean, you can't buy alcohol or cleaning products on SNAP (not that this means alcoholism and untidiness are on the decline because of it); so why not ban junk food, too? It's not like junk food is good for you (there's a reason it's called "junk"), and it's not always easy on the wallet, though it may appear that way at first. Sure, a Big Grab bag of Doritos may seem like a good deal at $0.99/bag, but is that even filling, let alone nutritious? Absolutely not. Same goes for all those little pastries and cakes, the sugary cereals, the sodas, etc. Eliminating these as options under the SNAP program would force folks who use it to look to the other aisles in the store for better food choices. But that's not always easy, Poor Girl! Yes, I know that! Change is never easy for humans but fortunately, we have the capability to do so. You have all seen me do the shopping and the cooking over the past few years because I did have to change things to stretch my food budget and put better food into my body. There was actually a time when I was living on was the Big Texas Cinnamon Roll from our break room's vending machine because it was cheap and I needed my money for bus & light rail fare over food. At 410 calories of fat & carbs, I had the basics that kept me going for the whole day, albeit sluggishly. My old coworkers were actually worried about me because I was so painfully thin during that time, and I was not feeling well. So I know what it's like to try & eat as cheaply as possible, but I also know that that does not need to mean living off a vending machine! What I eat now is way better for me and has brought out the inner chef in me, and except for the occasional evil dessert, what I post is food that is nourishing and balanced. Of course, I cannot afford all the certified organic stuff out there, or the specialty foods that are said to be more nourishing than "regular store" foods, but I do what I can within my means. It takes careful shopping and some creativity, but thinking outside the box can help stretch your budget quite a bit. Eating well on a budget is entirely possible and I do it everyday. My short experience on the SNAP program helped me to continue doing this during some of my darkest times, and for that I am eternally grateful. But I do believe that some things could be done to help those on limited incomes to eat better and avoid that vicious bad food/health cycle. Restricting the bad stuff is just one idea, but I believe that educating SNAP users would be even better. Showing folks the foods that they can turn into zillions of different meals so they stretch out their food dollar; giving them recipe ideas that are both tasty and nutritious; educating them about the dangers of fast food and junk food so they realize the importance of healthier choices; all of these things should be part of the SNAP program. Financial assistance is very helpful - I can definitely attest to that. But the knowledge and tools to make healthy choices for life are absolutely priceless.